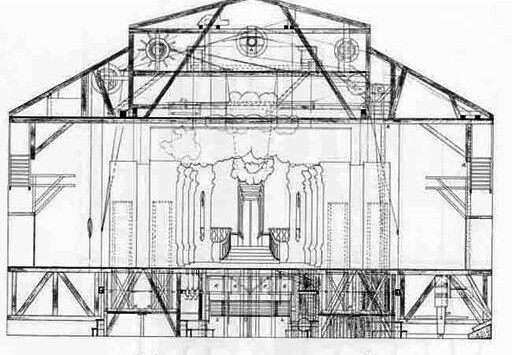 I see theater sets as processes that must share the same scene. 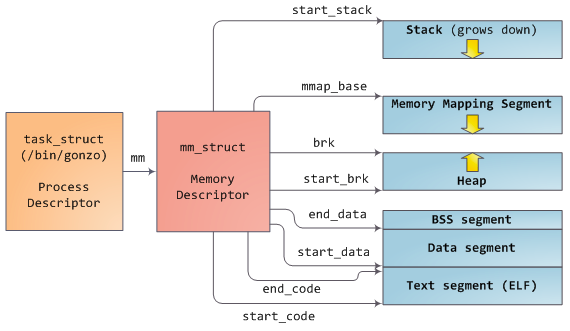 This blog has 2 posts about that topic: How the Kernel Manages Your Memory and Anatomy of a program in Memory. Chapter 9 of Computer Systems: a Programmer’s Perspective. The following is a way to express what I understood so far. I enjoy making links between arts and computer science. I see the way the kernel handles the memory (RAM) as a theatre stage. It creates a uniform, very organized way to show very different scenes with important size and efficiency constraints. The decors can either be pulled down, they are in mapped in memory, ready to be pulled down and they are attached to some machinery ready to go, or tucked away on disk (rolled up in the basement). It is easy on a theatre stage to switch from a kitchen to an exterior scene, similar to context switching, where the CPU switches processes. All the decors are basically the same thing, a sheet of painted paper that goes down, and painted wood on the side. Several decors can share some elements. 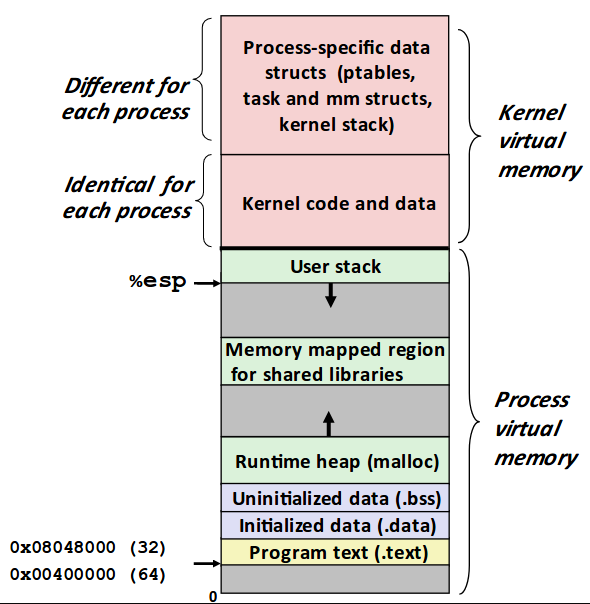 The kernel makes a similar representation of programs’ memory, they are all represented the same way (see below and /proc post), this is the virtual memory, and there are also shared memory segments, like shared libraries. As the play goes, a scene (the CPU) may require to make rain (get value at address a). This is translated into orders a machine or humans can follow like “add a painted cloud” and someone must fetch it. Similarly in the machine the memory management unit must translate a, it has to figure out its actual physical location and the value must be returned. The Virtual Memory can be used for caching, memory management and memory protection. Memory management requires a close cooperation between hardware and the kernel. In order to deal with memory, there is the concept of a page: that is the unit of transfer. a physical page cached in RAM (option A). In that case, the MMU is then able to reconstruct the address of the variable, and the memory can return the variable. a page that is not cached in memory(option B). In that case, a page fault is raised, a victim page in RAM is selected, the page holding the variable on disk is loaded in memory instead, and the page table is updated. The system is back to option A.
unallocated (option C). If it is not allocated, then a call to malloc will mark it as allocated, return a value, but it will not be mapped with actual physical memory (see this post), that will only be done when the process actively reads/writes at that position. Multiple processes may call the same pages, such as common libraries. In that case, to be more efficient, the page is loaded once in memory, as shared memory and the processes can map this single instance in their page table. Randall Bryant slide depicting the virtual memory of a linux process. Linux decided to represent the virtual memory of each process in the form represented above. It creates different areas or segments. Addresses increase from bottom to top. 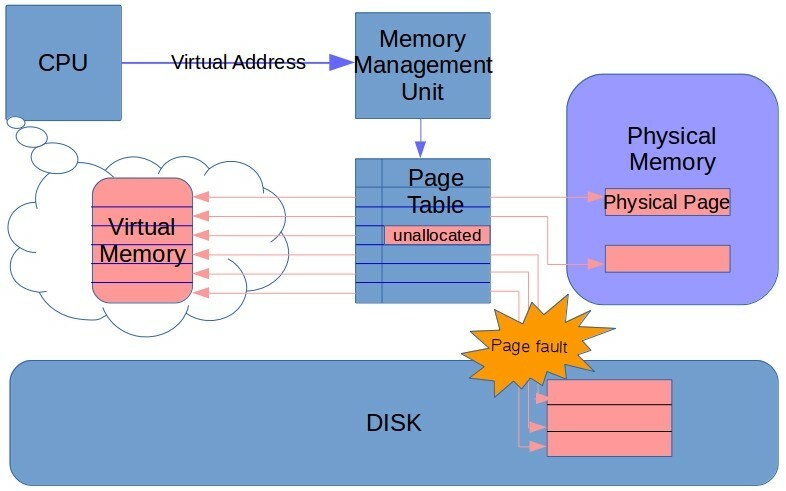 An area is defined as as a continuous chunck of allocated virtual memory whose pages are related in some way (Computer Systems: A Programmer’s Perspective). This representation lies in the mm_struct of the task_struct the kernel maintains for each process. exerted from the blog mentioned above you should really read. For each running process, this is written in the file /proc/[pid]/maps (see this post for an example). The string “Hello World” is actually located in the text segment, located below the heap, itself below the stack. I feel my recent knowledge is still a bit shaky, and I will need to read up on it more, and maybe find myself in situations where it will come into play to get more hands on.